Finnabair: International Scrapbooking Day - and Prima blog Hop! International Scrapbooking Day - and Prima blog Hop! I'm so very happy to see you here on my blog! As my other great Prima friends I'm taking part in Prima Blog Hop, which is part of celebrating of hm... International Scrapbooking Day! What can be better than that? Are you ready for blog jumping? So, here we go! Today we've got a Live with Prima Marathon! Classes start at 9 am ET and run all day long! You will have the possibility to have a peek into Prima office and see a bunch of talented Prima teachers sharing their projects with you! I'm sure it will be a great time for all of us - see you there! If you are ready for the next jump - here is the "checklist" for you! Please visit my friends and share some love for Scrapbooking :) Let's jump! Anna Dabrowska - You are here!!! As always inspiring work. Totally love your layouts and use of all those metal pieces. You inspire me to try something new. Beautifully inspiring, Anna! Happy (inter)NSD!! OH, & my fave Prima are their wooden tickets...go figure!!! Love your work, really art pieces everytime !! I love your line with Prima! So thankful you introduced me to their canvas resist when you were here in Florida last year. I love your artwork and look forward to see what else you come up with. Now I am off on the hop! I know most folks would say they love the prima flowers right? I love your mechanicals and junkyard findings as well s the resins. Your work is exquisite ad thanks so much for sharing your creative projects with us! That is a very long hop - I will do my best!! Your layout looks fantastic, as always!! I absolutely love it. So gorgeous! I bought a pack of your Mechanicals flowers and I absolutely love them - I used some of them on a layout here. Ok I have always loved the flowers, but I just got some Prima metal flowers that I think is my new all time fav!!! Your layout is gorgeous!!! I have been a fan of your work for almost a year! It is totally Awesome! I have always loved the Prima Flowers, but your work has me constantly wanting more embellishments! Love the way You take things to the next level! Thank you so much for sharing your creativity with us! Hugs! Your creation is totally amazing!!! I can only hope to one day create something as beautiful as your layout!!! Happy NSD and thanks for the inspiration! Happy NSD Anna! Love to see what you come up with. My recent fave of Prima is the Hello Pastel collection. I have more of a girly style when it comes to scrappin. Happy NSD! Love the metallic look. I would never have thought to do that, but am going to try it. Love your layouts Finnabair! :) So looking forward to playing in a new class with you at ProzArt! :) My all time prima favorites must be the Corrine flower.. :) but, I do love all prima products.. So they are all on the top of my list! Stunning grungy romantic layout! I love the new Pastel line and Leeza's collections! my favourites are the Junkyard findings.. although there is a huge space left to love the flowers. you cant not love them. your page is amazing. and congratulations on your wonderful talent being spotted and given a space to evolve. Beautiful layout!!! I love the metal embellishments!! The colours are great!! Happy NSD & enjoy your weekend!! Happy NSD! your background works Always stuns me.. such gorgeous mixtures of colours ! the grungy feel that is uniquely 'finnabair' style! Flot, du har din helt egen stil. knus morkaren. Ohhh wow I love this. Love your beautiful creations! The Prima flowers are just outstanding! I love this collection. You are so talented! I just love the warmth in that layout! Impressive! I have no idea how you do this. I have loved this Hop from the beginning, but I must say this is my favorite piece. I love the colors, the use of metals, and everything about it!! Your style is truly unique! I love everything in YOUR line of products! Congrats and keep em coming!! Absolutely gorgeous LO!!! Brilliant! I LOVE the mechanicals and sunrise sunset elements! I love your work. The layers are great. I can't pick just one collection this year because I love them ALL. And I love all the products too, but the flowers always melt my heart. Thanks for the chance to win a prize. LOVE your layout completely and I love your pages and your line....its outstanding and so so very inspiring. Thank you, thank you for trying to help us. Beautiful amazing layout!!! I love your projects!!! Неповторимо!!! А Prima цветы великолепны в металле! Wow! That just blew me away!!!! Gorgeous colors and the metal bits are fabulous!! Embellishments are my favorites, and I love how they are used here. Happy NSD! Love your project, thanks for sharing! Oooh my....this is SO beautiful. I love all the different elements and the colors are simply fabulous! Happy NSD! Such an awesome layout. I love it. Your layouts are awesome. I love your work and projects and this is awesome as well. I also love your line, and have purchased some of it. I just hope to see a video from you soon 😃thanks for the inspiration. Stunning LO Anna, to be honest, you will always be my favourite Prima designer I think.... and my favourite product? : the mechanicals and you use them in such an amazing way!! Another inspirational piece Anna. I love your Mechanical and Sunrise Sunset range. Your Scrapping Patch NZ class had me on a buzz for weeks. Thanks so much for igniting my mojo with all the inspiration. Happy NSD. You are such an amazing artist! Love this piece! This is a really cool look. I have never tried it, but have though about adding some metallic to my mini's covers. Thanks for the inspiration! Ohhhhhh love your work so much!!! I am a fan so in love with what you do!!! My favorites prima is the flowers but love everythings !!! Anna, your work is so beautiful! You are such an inspiration! Magnifique ta page , J' ADORE . Bon dimanche , Bisous .Anita F.
Love the layers, very beautiful, thanks for sharing! You always amaze me Anna!! Super cute tags and layout!!! Thanks for sharing!! LOVE your colors. It is early HOT summer in SoCal and your colors look fall, my fav season. But, no LSS anymore around us, hhave to wait until Art Venture to see new products!!! I love your work! Thanks for sharing!! Stunning layout! Love your new collection. been a fan of your style for many years now Finnabair - I've followed you on Scrapbook.com for about 4 years. Thanks for the continued inspiration. Such an awesome page! My favorite new collection from Prima is your Mechanicals! LOVE LOVE your work, and this latest doesn't disappoint. love the neutral tones and browns. and of course the mixed media and metal. WOW - your layout is gorgeous - love the metallic flowers and your awesome Mechanicals metal embellishments!!! 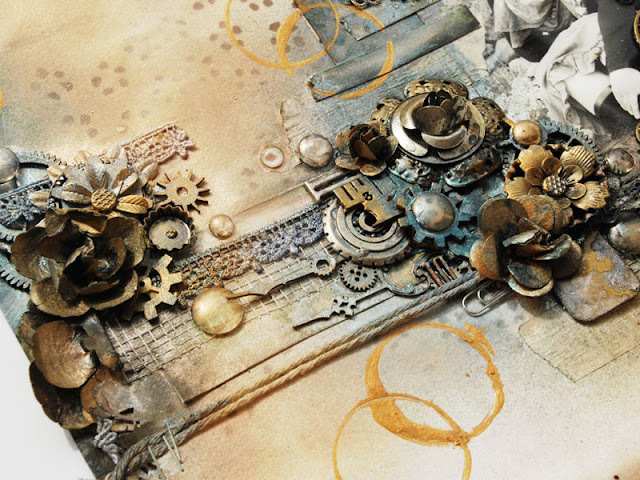 Anna, your art never stops to amaze me - I really love the way you put together flowers, gears and other metal things (that I would never have thought to put together) to create such a wonderful layout. Thanks for spreading the inspiration! Anna you have to be my all time favorite artist, I love your work it thrills me everytime you bring out a new work and I sit for hours watching your videos. Thank you for sharing your wonderful style and giving our art the wings it needs to fly. Beautiful work - absolutely stunning!! Awesome project - I love the warmth of your paper line. Aside from Sunrise Sunset and the Mechanicals, my favorite Prima release is Divine. Love the colors soooo much. Your use of metal is awesome. TFS. Gorgeous ! Love those colors ! Amazing work. I absolutely love the elements around the picture. Such a pretty and relaxing paper line as well. Take care and keep creating. Thanks for sharing with us. I love the mixed media projects. They are what have sent me in the direction Im in now, it was like an about face when I saw for the 1st time. 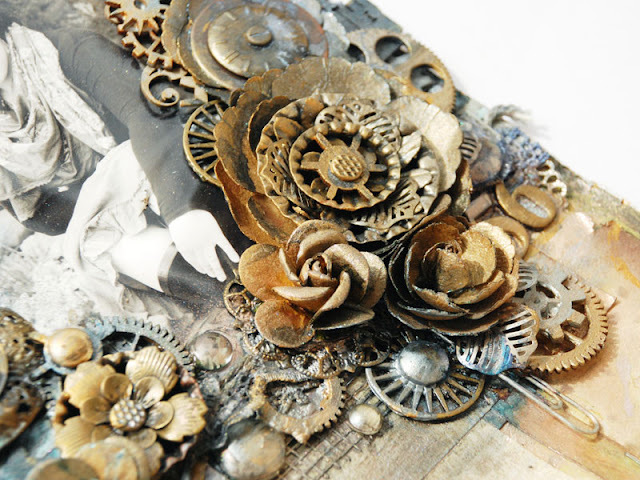 I love the metals and textures, flowers and then gorgeous prima papers. I literally lust after them. My absolute favs are sunrise, lyric, engraver and fairy rhymes. My 1st NSD has been absolutely amazing and INSPIRING. Thank you to all Prima family. Beautiful work, Finn! I love the bronze metal look. So freakin' awesome! Your style is different from most I have seen, but I like it! I have yet to try the Resist canvas.. but I hope to soon!! You do amazing work!! I loved viewing your page!! TFS!! oh nice.. so cool... love the metalics! This is areal masterpiece!Love your mechanic details! Unbelievable layout!!! I love it! Oh wow this is amazing!!! Awesome page!!! Thanks for the close ups! Wow...This is what i have been looking for and you have done a great job. Beautiful layout. Thanks for sharing.